It’s into the flames of Hell you go as you meet the Devil and the Grim Reaper in a slot that is based on the seven deadly sins in order to bring those who have committed the sins to their rightful place – and there are big wins on offer for helping out! Devil’s Delight is a 5-reeled slot machine containing 20 adjustable paylines with an impressive return to player percentage of 97.60% and it includes several bonus features such as the Soul Reaper bonus game, a free spins mode, and you’ll also notice a Soul-O-Meter which you need to fill in order to trigger Sin Spins, and with all these features it’s easy to see how there is a maximum win of 200,000 coins on every spin! Of course, this isn’t the first time we’ve entered the flames of Hell as we’ve also reviewed the Hand of the Devil slot machine from Bally and the Firestarter slot machine from Novomatic but this slot is all about pride, envy, wrath, gluttony, lust, sloth and greed as you find yourself surrounded by flames and listening to rather grim and eerie sounds! In the pits of Hell, you will meet all sorts of evil characters who have been designed in the style of a cartoon, with the most impressive being the Devil himself who appears surrounded by scorching hot flames standing tall with a pinstriped suit on before chucking his cigar into the flames as he is an Expanding Wild symbol making his presence felt on the second, third and fourth reels. A Pentagram is the Scatter while the Grim Reaper appears as the Bonus symbol, plus you’ll see a female Devil with a wicked grin, a chubby Demon who is grilling a sausage over flames, a baby Devil clutching a pitchfork, a Demon sticking its head out of a blood-filled cauldron, the infamous ‘666’ numbers which are known as ‘the numbers of the beast’, a pair of dice being thrown by a skeletons hand, plus Ace, King and Queen icons in the style of a gravestone. Usually the thought of coming face-to-face with the Grim Reaper would make you quake in your boots, but you’ll be welcoming him on the second, third and fourth reels as it sees the Soul Reaper bonus game activated offering you the opportunity to win up to 500x your stake. You will be transported to a second screen with a street design where there are various characters. On the left hand side, you will see five of the seven deadly sins listed (gluttony, lust, sloth, pride and wrath) and your task is to match the sin to the correct character. If you correctly match the sin with the character you will witness them dying in a humorous yet horrible way, but you get a cash prize to soften the blow and your Soul-O-Meter increases by one each time, however an incorrect match sees one of those sins lost reducing the number of souls that can be taken. Once you have filled all 15 soul positions of the Soul-O-Meter you will trigger the Sin Spins feature which never fails to result in delightful wins. This sees you activate a free spins mode where you receive 10 free spins on an alternative set of reels where only the seven deadly sins symbols feature along with the Expanding Wild which appears across the middle three reels. The fact that there are less symbols on the reels makes it much easier to land high-paying winning combinations, however it is interesting to note that the coins accumulated in the Sin Spins feature are based on the average stake that you placed in order to collect the 15 souls to fill the positions on the Soul-O-Meter, meaning the bigger you bet, the bigger the wins will be! There is also a standard free spins feature which can be activated by landing three or more Pentagrams (Scatter symbol) on the reels at any one time. You then click on one of the Scatter symbols in order to reveal the amount of free spins that you have won (between 7 and 17) along with the multiplier bonus (worth between 1x and 5x). Throughout your free spins landing two Scatter symbols enables you to pick one of them to reveal yet more free spins! 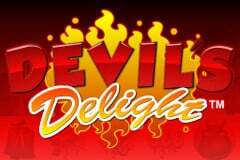 Devil’s Delight is an exciting slot filled with bonus features and can be played at the best UK online casinos, but what’s most satisfying is that progress your filling the Soul-O-Meter is saved for 48 hours after your final spin as nothing would be more frustrating than getting close and then having to leave your session.